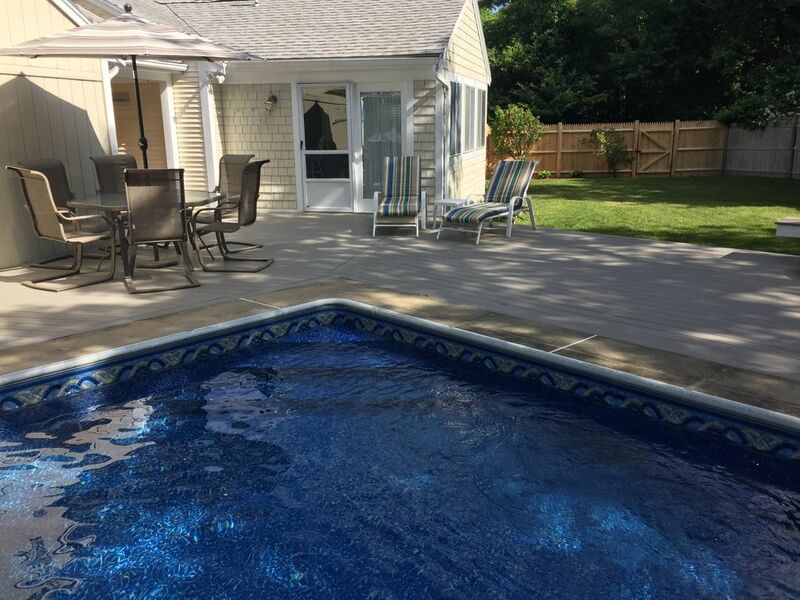 Enjoy the best of both worlds with this 3 BR, 2 Bath home with a heated pool in a quiet neighborhood just minutes to Dowses Beach and downtown Osterville. Home has newly remodeled kitchen, whole house AC, bright and airy sunroom that opens onto a brand new wrap around TREX deck and built in pool . Large fenced in back yard with outdoor shower. Full laundry in basement with finished bonus room for movies and games. An included Landlord Beach pass gives free access and free parking to all 15 Barnstable public and resident-only beaches/ponds, including Dowses and Craigville Beach - both just minutes away. Comfortably sleeps 6 with one King, one Queen bed and 2 twin beds. One set of sheets with blanket and comforter per bed is provided. Fireplace in living room for ambience/decor only. Not to be used as chimney is capped. Complete set of dishes and glassware for inside and outside dining. Complete set of pots, pans and bakeware. Recently remodeled kitchen with granite countertop and new appliances. Inside features a bar and stool set for 2 and a table for 4. Outside features a patio table that seats 6. Board games in basement playroom. Newly landscaped fenced in backyard with hammock. Newly installed Trex deck patio with loungers, offset umbrella and patio set. Private heated pool with new liner. Great vacation home in Osterville! This cute, comfortable, well equipped house is located in a nice, quiet residential neighborhood. It is close to the town of Osterville and stores and beaches are not far away. The house has a great private fenced in backyard with an in ground pool, nice deck furniture, and a grill. We spent our mornings on the beach and the afternoons relaxing by the pool. The pass to the beaches/parking is definitely a plus! We took the ferry from Hyannis to Martha's Vineyard and went to Mattakeese Wharf in Barnstable where we went on a whale watching excursion and had a nice dinner overlooking the beautiful harbor at sunset. We had an awesome week and would definitely stay there again! My family (kids ages 8,8,5) just had a wonderful week at this magnificent Osterville home! Everything was perfect....nice towels and linens, well-equipped kitchen, comfortable beds, grill, gorgeous heated pool, deck, yard, everything!! Carol was very responsive during the week when little questions came up about the pool or how to operate the garbage disposal. We've rented for many years and this was by far our best experience. Perfect quintessential Cape house in charming Osterville! new deck furnishings, a grill, a hammock and outdoor shower. An extra bonus pre-post beach adventures! The lovely owners have provided their guests with a Landlord beach pass to all Barnstable beaches/ponds plus parking is included too. There are so many options to choose from that the week was filled with beach hopping as this was our first time in the area and found each one lovely, however Dowses Beach proved to be ideal for the proximity, size and soft white sand. The location is also very close to Hyannis, which we took advantage of by ferrying over to Nantucket for the day. The home itself is comfortable, light and airy with beachy decor in every room. The owners have provided a well stocked home for guests to enjoy their vacation. From a fully equipped kitchen, new appliances, music system, flat screen tv, pool towels and flotation devices to washer and dryer and basement play area. The owners are delightful to work with and are accommodating. We enjoyed our stay immensely and will be back again next summer!